Captured by an evil wizard, you've suffered the most unusual video-gaming fate to date. The dastard turned you into a rubber ball, then bounced you into a hostile world. Rolling and tumbling, the gamer has to navigate through his mansion seeking the spellbook of instructions for regaining human form. Airball's unusual theme turns this arcade-action game into an adventure. 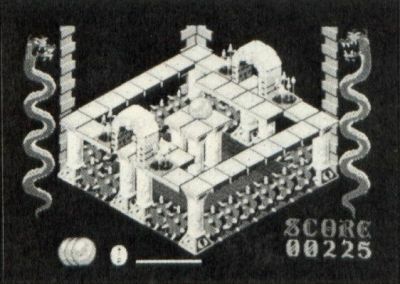 As the rolling ball, the gamer must explore the maze of over 150 rooms. This would be difficult enough, since the castle is a warren of steps, ramps, and narrow passages bounded by sharp objects that can puncture and destroy the fragile balloon. But that's only half the problem. The Airball has a slow leak, and the remaining air pressure is indicated by a yellow bar across the bottom of the screen. To refill, the ball must bounce on top of one of the pumps scattered throughout the mansion. Then the gamer has to choose the right moment to roll the ball off the pump, since too much internal pressure makes the balloon burst. Helpful objects are scattered through the house, like a flashlight (indispensable in the dark room), gold bars, and other point-scoring prizes, some of which are needed to undo the shape-changing spell. Each time the ball is destroyed by over-or under-pressurizing, or by being punctured with a sharp object, a cross marks the spot where it died. The next time the ball rolls past that point, the gamer can pick up this grisly reminder of past lives; it's one of the ingredients needed in order to return to human form. The mansion is viewed one room at a time from a three-quarters overhead perspective. Rolling through an arched doorway blanks that room and brings up the next one. Prizes are randomly scattered throughout the castle. To win, the gamer must find and return the spellbook to the starting room, then locate the items required in a sort of rolling scavenger/treasure hunt. Accumulating all the ingredients wins a message of congratulations—and an offer to play again. Players control Airball with keyboard, joystick or mouse. The ball can be moved up, down, left, right, or bounced, and the player can pick up or drop items found in the mansion. However, it's not an easy play mechanic to master. The three-quarter perspective makes it hard to get the hang of controlling the ball. The beautifully drawn playfields incorporate stone archways, walls and staircases which the ball can pass completely around. This is a lovely effect, but it's frustrating when the ball gets stuck in a blind corner. Airball is an extremely pleasant, even addictive, action game. The pretty play-fields, bounded on each side by ornamental wriggling snakes, and the pleasant musical accompaniment, make rolling the orb a real ball!